Gritty and irreverent, exceptional and self-effacing, Mo Beck ’09 is a movie hero that audiences can get behind. She’s a key reason Banff Mountain Film Festival crowds at screenings throughout the world have consistently voted “Stumped” as a fan favorite. Juries at festivals in England, Spain, and Canada have agreed, selecting it for top prizes. It’s a thread that runs throughout with Beck, her climbing partner James Scheri, and their fellow adaptive athletes. The film challenges broad perceptions and media presentation of para-athletes, but in a manner that is a good deal more complex than the familiar television news “aren’t they so brave and inspiring” slant. In a phone interview from her home outside Boulder, Colorado, Beck describes how her own perspective shifted when she connected with fellow para-athletes in a Paradox Sports adaptive ice-climbing event during spring break of her senior year at UVM. She’d long been active as an athlete, but Paradox showed her a new level. “Their whole motto was, ‘I don’t care what you don’t have, show me what you can do.’ That was such a different tone,” Beck says, compared to adaptive camps she’d attended as a child that felt more conciliatory than empowering. The Paradox athletes climbed to the point of exhaustion all day, went back to the hotel, showered, then got the party started. “I was like, ‘OK, these are my people, I think,’” Beck recalls. Maureen (Whalley) Beck was born without a left hand. Her arm ends a few inches above the wrist. She calls it her stump, owning the word as she owns this non-standard part of her anatomy. She’s fond of hashtags like #stumpsnotchumps, #gimpsnotwimps, etc. When it came time for college, the Outing Club and vibrant outdoor programs helped draw her to UVM. She dove in, leading trips and trainings. She met her husband, Brian Beck ’09, an outdoorsy guy who grew up in Telluride, Colorado, during their sophomore year. Through their first few months of dating, Brian told her he’d done plenty of climbing out west. Then they drove out to Bolton Valley. Halfway up their first climb together, he copped to being terrified. But small compromises often make relationships work. These days when Mo is climbing, Brian, a software developer by day, goes along and finds the nearest stream to fish or trail to mountain bike. Mo Beck, who earned her UVM bachelor’s degree in forestry from the Rubenstein School of Environment and Natural Resources, is in sales for Eldorado Climbing Walls, enjoying a tight knit between work and play. As a competitive climber, Beck is a four-time national champion and earned gold medals at the 2014 and 2016 Paraclimbing World Championships. 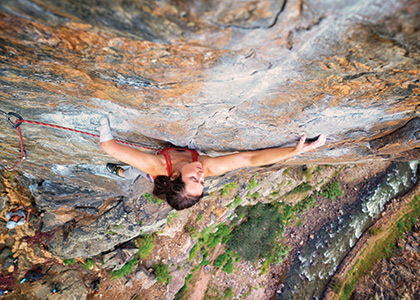 Two years ago, when she set her sights on the daunting threshold of a 5.12 climb, she had a quest and her filmmaker friends had a compelling protagonist and story. As for what happened next, no spoilers here. Google “Cedar Wright Stumped” to find the film on Vimeo On Demand.